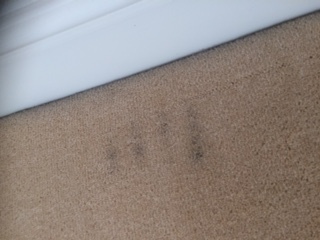 Do you have mystery marks like this around the edge of your rooms? Have you wondered what they are and how they are caused? Have you tried unsuccessfully to get rid of them? Marks like this are commonplace in newer houses although they are also seen in older properties. They are caused at the time of the carpet being fitted when the fitter stretches the carpet onto the gripper rods using a stretcher tool and he’s a little over zealous. The result is that he allows the stretch to puncture a membrane in the carpet structure . 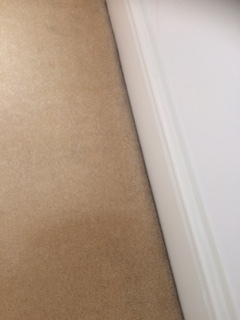 Over time minute dust particles which are blown around the cavities of houses find their way up through the holes in the carpet structure leaving these unsightly marks. I believe that it’s more prevalent in newer houses as the fitters are under pressure to fit out a numbers of houses a day and therefore rush the fitting process leading to the damage being caused. Whatever the reason what you want to know is can they be got rid of? Pre-clean inspection to establish carpet construction. Identify areas of concern including spots, stains, heavy soiling or issues over the fitting of the carpet. Fibre test to establish the pile fibre to ensure that the correct cleaning solution and technique is employed. Removal of furniture and preparation of the room for cleaning. Thorough vacuum of the room using our Sebo professional upright cleaner. This vital step can remove up to 80% of dry soiling from the carpet. Treatment of any spots of stains identified during the earlier inspection using our ‘spotting’ kit containing over 15 specialised products to deal with all eventualities. Pre-spray of the carpet using our selected detergent free cleaning solution. Agitation. This is a vital part of the process as it ensures that the cleaning solution is distributed evenly throughout the carpet fibres to ensure a deep clean. We have a number of machines available to perform this task dependant on carpet type including rotary, oscillating and heavyweight CRB machines. We then rinse out the solutions using only fresh water and extract using the powerful twin vacuums of our Jaguar 6.6 machine, the most powerful portable extraction machine available , to ensure that your carpets are as dry as possible. We then assist the drying process with the use of our ‘whole room’ dryers which assist in circulating the air, noticeably speeding up the drying process. We then replace all you furniture, and where necessary place them on plastic pads to ensure there is no transfer between the carpet and your furniture. Finally we groom the carpet pile to ensure a uniform appearance and to further aid drying.